Live Q&A — Mine: A confidence crisis. The mining industry faces a confidence crisis. Confidence over whether costs can be controlled, return on capital will improve and commodity prices will not collapse, among others. Regaining confidence depends on how the mining industry responds to its rising costs, increasingly volatile commodity prices and other challenges such as resource nationalism. Join John Gravelle, mining leader for the Americas at PwC Canada on June 14 at 2 p.m. EST for our live web Q&A to discuss the confidence crisis miners are currently facing. 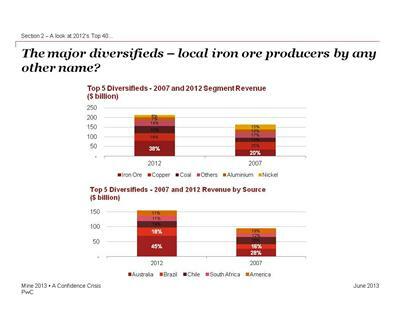 The report notes diversified miners are focusing more on iron ore, and therefore, becoming less diversified. How do you feel about this strategy? Thanks John and PwC Canada for the opportunity and the participants for the thought provoking questions have to leave the session now. The report indicates 50% of the Top 40 are based in emerging markets. Companies that want to sell cannot ignore 50% of the Top 40 so that will mean learning the different business cultures. 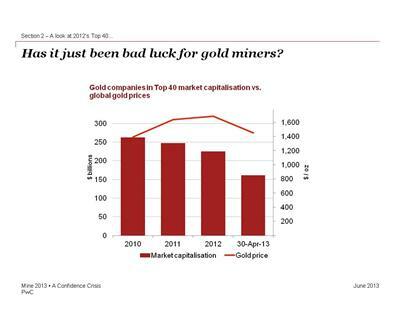 Last year’s report focused on the disconnect between commodity prices and mining equities. Is this disconnect continuing or is the gap closing? China has provied demand for commodities and capital to develop projects - it now has taken a role a regulator for the industry as it was the last government to approve the Glencore/Xstrata transation. Thoughts? Great discuss everyone! Thank you all for joining and look foward to doing this again. Last question from me John...What is your take on the situation(s) in Peru and Chile (just to name these two)? Lots of senior miners struggling to move their projects forward. That does not give much hope for juniors that invested millions and now they cannot seem to get any traction due to laws giving local communities the final say. Companies are spending MILLIONS in one quarter on social and that might bring them nothing. Is that investor money spent well?